This restored three bedroom house has been completed to a good standard and is ready to move into. One bedroom has two single beds and a free standing wardrobe so the space would be big enough to fit a double bed. The other two bedrooms are a single and a double. All three bedrooms have laminate flooring. The kitchen is nice and lights and is fully tiled. Thee space has been well used given the size, there are plenty of wall and floor units. The units are a fresh and clean white while the tops are a stylish black. There are also wooden beams in this room. In the dinning room the wooden beams continue. There is laminate flooring here as well. Here there is a table and there is still quite a lot of room. The living room is quite spacious, at the moment there are two single chairs and a double sofa so there would definitely be room for one large sofa to make the space into a nice family room. Here there is also laminate flooring. In this room there is the door that you can see from the front of the house. 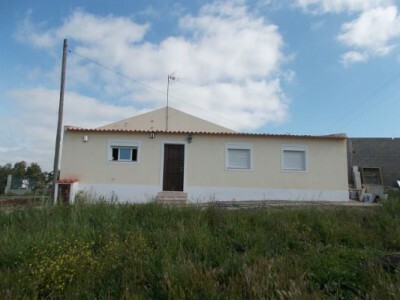 The house is only 2 minutes from the centre of São Pedro and 6 km away from Tomar. The village of São Pedro itself is a short walk from the property where you will find an English speaking Doctor and next door a Pharmacy, again with English speaking Pharmacists. Also there’s a cash machine. It has popular restaurants and cafes. The beautiful lakes and the town of Tomar itself are around five minutes drive. The historic town of Tomar, which is home to the UNESCO listed Knight Templars Convento do Cristo, is only six kilometres from Sao Pedro and has a choice of supermarkets, cafe bars, shops, restaurants, hospital, train station, bus station and university.